Don’t forget about scholarships and awards! We are just a few days from the deadlines for submitting nominations for the region’s awards, and applications for the scholarships. The awards are an important way to recognize interpreters and leaders in out region, so don’t be shy about recommending someone you feel is deserving, it only takes a couple minutes to fill out and submit the form. I think it is especially important to get students and young interpreters to apply for the scholarships. Regional workshops are so much fun and so beneficial professionally that I really think once we get someone to the workshop we’ve got them for life. In other words, these scholarships are something of a marketing tool. So if you get the chance, talk up NAI, the region, and the scholarship program to any young interpreters or students you know! Details on requirements, procedures, and the necessary forms are available on the workshop tab of this site. Thanks! Somewhere after writing nature trail interpretive signs for the umpteenth time, I began to question myself—who am I to tell this tale? Wouldn’t it be interesting to write nature trail signage from other people’s points of view? So for my next assignment I hatched a new plan to develop a living history trail which I dedicated a trail to William Bartram, the famed 19th century naturalist who had traveled the southeastern states. 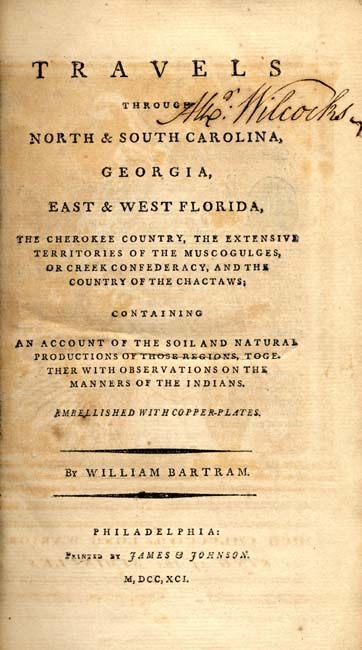 Using his popular and lengthy-titled book, Travels Through North & South Carolina, Georgia, East & West Florida, the Cherokee Country, the Extensive Territories of the Muscogulges, or Creek Confederacy, and the Country of the Chactaws; Containing An Account of the Soil and Natural Productions of Those Regions, Together with Observations on the Manners of the Indians (1779), I wrote the signage to include snippets of his observations on the plants and plant communities found along the trail. Bartram’s poetic observations of blueberry plants, pine savannas, land tortoises, and wildland fires were perfect compliments for our newly-built Savanna Trail. Notably, the information had not changed much in over 230 years. The new trail was a hit, and visitors learned a bit more about early southeastern explorers. Soon other living history trails followed, dedicated to entomologists, landscape architects, mycologists and other fascinating local or regional pioneers. I thought it would be most interesting to develop signage for a trail that would present one point of view from one direction, and an opposing point of view from the other direction. But I had to abandon the idea, for it seemed just a little bit too much like our current political climate. Does anybody have any similar thoughts on this?